The stone is a listed structure, part of our visible Roman history and an important part of the street scene. Although I have not taken to hitting the stone with a sword like my predecessors, I recognise that the London Stone is an intriguing part of the history of the unique City. As guardians of the past and future of the Square Mile, the City of London aims to ensure the stone -and any mythical powers it may have - remains intact. A great tale and many thanks to Chris Cheek for looking after the stone. Now, let's make sure it is kept close to ordinary Londoners, not lost in the storerooms of a museum. Look what happened when Carlisle moved its stone. Better leave it where it is I think. I'm from London and I never even knew it existed! What a fascinating story. Mr Cheek is a hero and should get an OBE in my opinion. 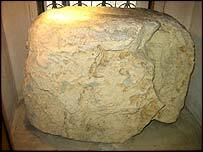 Something as ancient as the London Stone deserves to not be removed to a museum. Besides, if the proverb is correct, bad things could happen. Three cheers to Mr Cheek for keeping it safe! The stone has always lived in the heart of London, perhaps it is the heart of London, nothing can survive without its heart. Very interesting story. I think it should definitely be returned to its location once the new building on the site has been constructed. Also think the idea of having it on a plinth would be quite nice. Having these little artefacts tucked away in London streets is one of the things that makes our city so interesting. Chris Cheek deserves a medal! Or what about a new award - 'Defender of the Stone' - to ensure it's kept safe in future centuries - because there are a heck of a lot of dodgy builders about - with chisels at the ready! Leave that stone right where it is... terrible things will happen if we move it.. like beer going flat or losing the World Cup... Hang on... WHO MOVED THAT STONE? Being originally from London I loved the story. I never realised the stone was there and will definitely find it when I'm next down. As for the Stone of Scone, I heard recently that the stone currently at Edinburgh is a fake and that the original is believed to be buried somewhere in the Scotish countryside. Is this a widely held belief, and does anyone have any details? What a curious curiosity. Personally I agree with those people who think it should stay close to its current location. I think it's a wonderfully quirky, British thing to have a 'lost' artefact like this residing peacefully somewhere in the heart of the capital. The stone must stay close to where is is now ... I don't think we should risk the wrath of Gog and Magog! Just to clarify, the Stone will only come to the Museum of London temporarily while the site is being redeveloped, it will then be put back on display in Cannon Street. 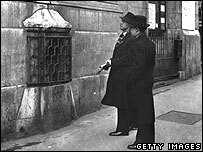 I'd walked past the London Stone every day on my way home, via Cannon Street and didn't have a clue it was there. Then one day I decided to go for a walk at lunch-time and spotted it. The associated plaque doesn't give you much information, so I found this article fascinating - having heard of the name, I now understand a little more behind it. The ravens are currently locked in the tower to stop them getting birdflu and the legend is coming true. Not sure a stone in the middle of a locked room of ravens is a good idea to preserve it. They might use it for target practice. What about the Trafalgar Square plinth ? Sad will be the day when everything that is ancient and woven with stories is confined to a museum. 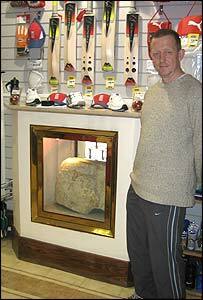 As a young man I went looking for this stone and eventually found it tucked away in the shop. That thrill then was worth far more than wandering past it in some museum in the 'ancient lumps of rock' section. Having read about this mysterious stone I made every effort to look for it during my stay last April, and I was thrilled to see it. Being a City stone, I think it should remain nearest to the place where it was found originally. I'm glad there's still some magic and mystery left in this country. We need more of it! The British Museum is too stuffy to keep it. This is supposed to be a living momument, not a relic, and it belongs in the City of London. Besides, the cricket section of a sports shop is a far more suitable place to keep it. 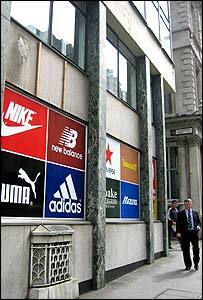 I wonder how many of these ancient monuments sit in our busy streets unnoticed. In Kingston there is a coronation stone in a shady patch of grass beside the guildhall on which were crowned seven Saxon kings of England. I have never seen anyone near it and the only sign post to it is a small brown sign above a bus stop. I just love that. There is so much history in London surrounding us everywhere we simply take it as read. What irony. The London Stone is an old old reminder in the heart of the Saxon capital, that the great city of London used to be a Welsh / British stronghold. Brutus is seen by many as the founder of the Welsh nation, our very own Hengist and Horsa. The stone of London is a wonderful story, and the reaction to it is also wonderful. Think of a stone of New York and have a laugh. The Indians having been obliterated it would have to have been put there by the Dutch maybe three hundred years ago? The approach of Americans to this limited history is instructive. A stone? Britons seem to respect not only the age of the stone but also its mystery and the myth that surrounds it. I don't think it should be put in a museum, it should stay where it is, if this is where it was originally placed (it may not like being moved!). I would not put the Stone in a museum, it has spent centuries on the roadside, surviving time, history, traffic and the blitz. It would be nice to move the stone away temporarily just to put it back on its place in a display incorporated in the new building, like it was done after WWII. I had never heard of the London stone but I now need to know more! Why move it? If it has stood on the same spot for so many years why lock it up in a museum? I should like to make a trip to see in situ. 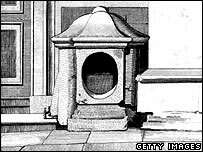 Rather than stuck inside or in-the side-of a building, London should build a pedestal nearby with a plaque describing the history of the stone. That way both Londoners and visitors can admire and reflect on the history that surrounds them. I think it is very important that the London stone should return to a safe and properly visible home on Cannon Street once the building works are finished. It must not be allowed to disappear into storage, or be put on display in a place which has to be specially visited, instead of simply being passed by thousands daily. This story reminds me of a children's TV programme where they move a sacred artefact and the world went a bit mad until it was returned...spooky! The Museum of London is a great place to visit and would do the stone justice. At the moment not many visit because they don't know. If they have similar legends attached to them, why can't the ravens in the Tower look after the stone? Can we have our Stone of Scone back please? No it's not - that's a fake. I've got it. While we are at it, can we have our Koh-i-noor (the diamond on the queen's crown) back please? Can we have our marbles back? Until you give us 12 points at eurovision you will never get your marbles back...so there! Can we have our shipyards back? Oh and can we also have our capital city status back please?